« Advent Calendar Window No. 16. The Old Vicarage, Magpie Road. Sunday December 17th. Carol Concert in the Church of St James and Advent Calendar Window No. 17, Magpie Farm. Carol Concert in the Church of St James the Less, with the children collecting the nativity scene figurines from the altar and arranging them in the crib. Later on the same day, villagers made their way to the Magpie Farm, almost a mile west of the village, for the unveiling of the 17th Advent Calendar Window. See pictures of both events in “rest of this entry”. Christmas decoration in front of the Washington Memorial plaque. The nativity figurines are arranged on the altar for the children to collect. Each figurine is given a number and is collected by the child randomly allocated that number. The organist has driven many miles to play the newly restored organ. The permanently installed flags of two nations hang over the crib. The proceeds of the collection during the carol service and funds raised on advent calendar evenings are to go to NARA Breathing Charity, which provides breathing monitoring equipment for children and babies suffering with respiratory problems. This photograph is of Sara Louise with baby Ida. She has requested that the funds raised through the advent calendar windows should be used to support this charity which has helped Ida so much. She says: “They have been a godsend to us. Earlier this year, when we were sent home from hospital with no apnoea equipment for 4 week old Ida, no medical explanation or support and only basic CPR training, we called NARA on the very night we were discharged. With no hesitation, the lovely lady who runs the charity brought us an apnoea monitor round – this was at 9pm on a Saturday night! As Ida had stopped breathing numerous times in her sleep previously, there was no way I could have slept without one of these monitors! They saved us a fortune and saved our little one’s life…. It alarmed on 4 separate occasions and I was woken from a deep sleep and able to get Ida breathing again. Thankfully we haven’t needed to use it in a long time but the charity has insisted we keep it for a few more months for our own peace of mind. A truly amazing little charity”. The organist is thanked for his contribution to the service. Emerging from the Carol Service at dusk on a damp and cold evening…..
….and so on to the Sunday evening’s Advent Calendar Window unveiling, at The Magpie. Pleasure at receiving congratulatory messages……. …..for Georgie’s birthday, who is seen here listening to a spirited rendering of “Happy Birthday to You”! One night at the beginning of January in 1963, snow driven by strong easterly winds piled up into huge drifts to the leeward side of hedges aligned in a north/south direction, as here at The Magpie. ….often completely covering the hedges. The village awoke to find itself cut off from the world. For an isolated community such as Sulgrave there were no snowploughs or gritting lorries. However, gangs of men with shovels were soon at work. Unfortunately the strong easterly wind continued for a week or more and roads cleared on one day frequently had to be dug out again on the next. As director of the family building business based in the village, my father was appointed by the County Council as “Parish Snow Officer”. He can be seen here with the book in which names and hours of work were recorded. The diggers were rewarded with a payment of three shillings an hour (15p). The freezing conditions persisted for six weeks. I took this photograph from my car betweem Sulgrave and Helmdon, part of my daily drive to work at Oxford (note the “state of the art” wing mirror on my Ford Anglia!) There were far less cars in the early sixties but eventually some passing places were dug out. 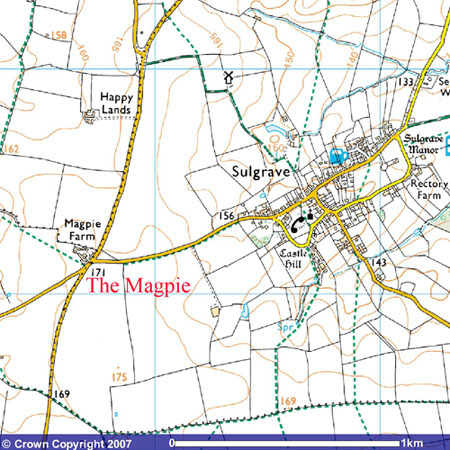 Read more about The Magpie Farm in former times in Chapter One of “The Chronicles of a Country Parish” (A Village Appraisal of Sulgrave published in 1995). The Chronicles can be accessed from the front page of this website. This entry was posted on Monday, December 18th, 2017 at 10:31 am	and is filed under News. You can follow any responses to this entry through the RSS 2.0 feed. You can leave a response, or trackback from your own site.